When I was growing up I believed, like most people, that when the windy season came around people busted out their kites and had some fun. 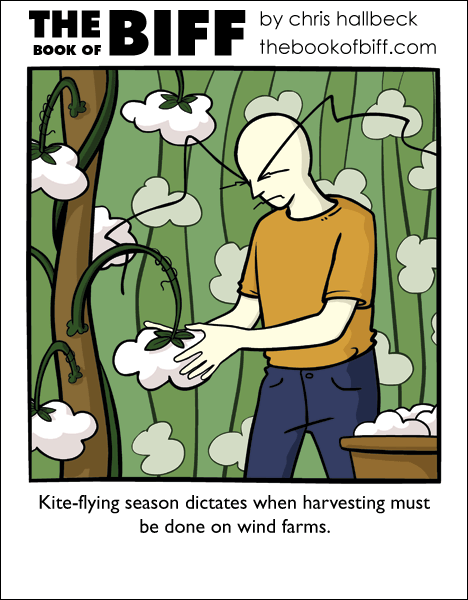 It’s kind of sad now that the three families that control the kite flying industry in North America have been exposed. Their demands on the wind farmers of the midwest nearly destroyed an entire generation of those noble people. It’s a relief to us all that control has been put back in the hands of mother nature. Now the young clouds can be picked when they are ready instead of whenever the high-flyer’s pockets needed an influx of cash. I’m going with Reaper on elements week. There is no fifth element if you use classical greek elements, but there is “Spirit” if you go with neo-pagan elemnents. Haven’t you seen the movie with Bruce Willis and Milla Jojovich? The fifth element is love, of course! Or perhaps cheese. I would also accept cheese. By your powers combined I am Captain Planet!!! Bah! “The Fifth Element” totally stole that from Captain Planet! The 5th element is the Human element. The fifth element is surprise. Biff’s workplace must be massive. I also, would accept cheese as the 5th element. Does that mean we’ll see Leeloo on Friday? @LazerWulf–In Eastern Mythology, the fifth element is aether (as in the soul or something like that). Would you prefer both movie and TV show use that instead? And besides, Captain Planet is heart. @ Chris–Does this mean Biff is the avatar? LazerWulf, lightning was also another element in Pokemon. Regardless, it is clear that Chris will be extremely imaginative when creating the comics this week (although, what’s changed?). The fifth classical element is Aether. No wait Micah beat me to it, but I thought it was a greek thing, not an eastern thing. Looks like I have to re-write one of the comics. I thought the 5th element was bread sticks. Oh! There clouds! I didn’t get what the white puffs were. D’uh. Ah breadsticks! Possibly they are the 6th element, Chris. You weren’t too far off. Nevertheless, because it’s only five comics a week, there is no room for breadsticks. I think the fifth element is Internet. If it isn’t, Biff is a good element too. Chaoticag, greek = eastern is perhaps not 100% accurate (depending on where do you use it) but I think eastern roots are quite based there, of course I might be misinformed. The fifth element is disco, because we already have Earth, Wind, and Fire. Does this remind anyone else of Windwaker? Who were the first 4 elephants? BORON! THE FIFTH ELEMENT IS BORON!!! @chaoticag –Hmm…might be Greek, too. I’d have to go with the 5th element being light/darkness. Biff could be the god of glowsticks. I thought the 5th element was Life/Death. I thought that the fifth element was duct tape. And I think its amusing, but futile to guess what the fifth element is going to be so I’ll wait (and read everybody’s guesses). The fifth element if called “void.” that’s supposedly what makes up stuff like the moon, sun, and stars. IF I’M RIGHT ON FRIDAY I’M GONNA SCREAM. The fifth element should be Biff energy, the strongest element in the universe. According to some other webcomics, the fifth element is death. Though if you are as geeky as I, you realize that in addition to the four elemental “planes” of Fire, Air, Earth, and Water, there are also two energy elemental planes, Positive and Negative, and each of these six is suspended apart from its polar opposite. All other pseudo elements (such as dust, smoke, and lightning) are derived from the quasi-planes suspended between two elements, such as fire and earth to make smoke, and fire and positive making lightning. But if you played dnd, you already knew that. I suppose the fifth element could be metal or wood according to chinese astrology. Nonetheless, I still expect to see Biff buried in some earth. I had five fifth elements collected from previous guesses, not counting my Boron entry. Totally out of my element on that one. pfft… i once had a REALLY crap nds game, it said the fifth element was… harvest. what moron thought that up? harvest is basically earth! lightning, love, metal, wood, and i think thats it.